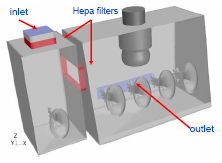 ..: Consultancy Projects - Pharmaceutical Industry : Application of CFD to Isolator Design :..
Design principles for containment equipment are not new. The early nuclear and biological industries had to develop closed systems for handling very hazardous materials. As the manufacture of ever more potent and toxic pharmaceuticals grows, so does the need for employee and workplace protection. Figure 1: Geometry of Pack-off Isolator. Rose Consulting Engineers Limited (RCEL) have applied their experience from the nuclear industry to the design and development of such isolator systems, using Computational Fluid Dynamics (CFD). A full 3D computer model is built, see Figure 1, and the operating conditions such as flows, temperatures and pressures are applied to this engineering model. Commercial CFD software is used to solve the Navier Stokes equations of fluid flow and the results are then post-processed in order to give information regarding the performance and suitability of the design. Figure 2 shows the distribution of air velocity around the gloves. The velocity increases a little as the air enters the main chamber through the transfer filter, but generally conditions are relatively quiescent. Figure 2: Velocity Contours around Glove. A good design needs to keep the chamber atmosphere clean but not interfere with the process operations within the chamber. The CFD results allow the designer to interrogate the internal flows for any unwanted turbulence or dead spots. The use of this modelling tool quickly allows an assessment of the design and saves costs by reducing the amount of prototypes that need to be built and tested. Further, the range of quantitative data available from the CFD models provides much more information to the designer, compared with that gained from smoke or other flow visualisation experiments. Article reproduced with kind permission of CPS-Extract.